VINTAGE/ANTIQUE DRAGON HANDLED-CARVED DRESS CANE/STICK- FILM PROP? Carved dress cane/ walking stick featuring Oriental Dragon handle. 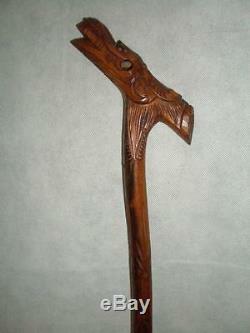 Carved walking stick featuring detailed Dragon handle. Dragon features free rolling ball behind it's jaw Eyecatching, dramatic cane Some splitting and surface wearing to the wood due to age/use Ideal for use as a stage/film prop SEE IMAGES FOR ITEM CONDITION Measurements Overall height: 104cm Shaft Width: 2cm Handle length: 14cm Widest point of handle: 2.5cm. Auctiva's Listing Templates improve your auctions in minutes. Attention Sellers - Get Templates Image Hosting, Scheduling at Auctiva. The item "VINTAGE/ANTIQUE DRAGON HANDLED-CARVED DRESS CANE/STICK- FILM PROP" is in sale since Sunday, October 30, 2016. This item is in the category "Antiques\Woodenware\Walking Sticks/Canes". The seller is "gerwyn-2009" and is located in Pontyclun.